I sometimes spend a lot of my time and blog-space publicizing (often, through criticism) other products, websites, hotels, etc. But sometimes I just want to show respect for great ideas. And nothing excites me more than green initiatives! While going through Gopal Shenoy‘s blog on Product Management tips, I got to learn of this cool company called Gazelle he joined. Gazelle, based out of Boston, pays you for taking away used electronics which it recycles. So instead of going to landfills, you’re gadgets are erased and either re-used or sold in the secondary market. It takes a week after receiving the gadget to complete inspect it and issue the payment. What more could you be asking for with Money in one hand and carbon-credit in the other! 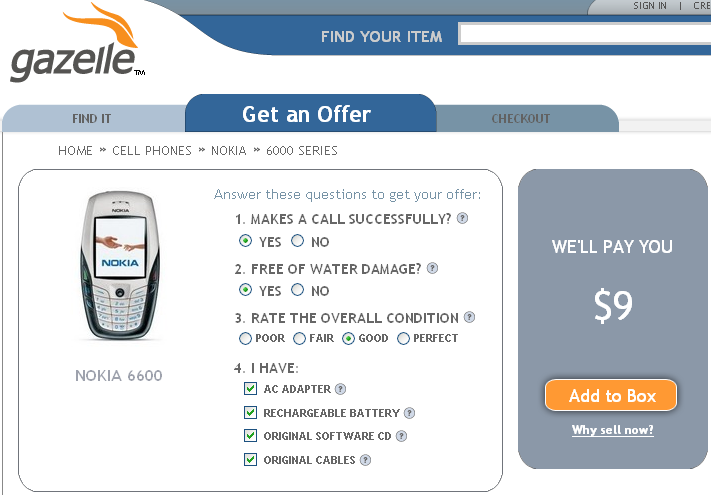 I got too excited and checked what I will get for my 4 year old Nokia 6600! Have a look at the disheartening result!